Check one more lifetime accomplishment of extremely dubious value off the list: I’ve now run over the Ross Island Bridge. There’s no reason to ever do this, other than to say it’s been done. The bridge run is seven-tenths of a mile on a sidewalk with four lanes of very fast traffic shooting by right next to you. The river view from up there might get more interesting when they get further into the construction of the new Portland-Milwaukie Light Rail Bridge, but for now you find yourself looking at pretty humdrum section of the river with a few barges and cranes playing around it it. The west-side approach to the bridge is pedestrian-unfriendly, involving scrambling across a crosswalk-free ramp. Neither side is particularly easy to navigate on foot — it’s not obvious just how to get up to the bridge from the more usual running paths down along the river. 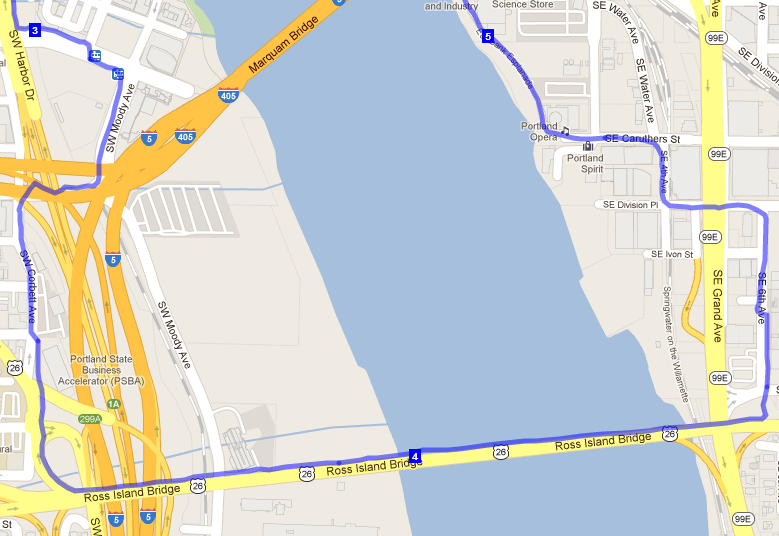 (I ran west-to-east, since I had a slightly better idea of where to get onto the bridge on the west side, and figured getting off the bridge would be easier to figure out than getting on.) I can’t give any good directions, but if you stare at that GPS-generated map up there closely enough, you might get the idea. The seminal work on being a pedestrian on the Ross Island is, of course, cyclotram’s “How to walk the Ross Island Bridge and not die, if you’re lucky“. It is an absolute must-read for anybody with any interest in the topic of how crappy it is to walk across the Ross Island Bridge. It is a true classic in the genre. (I refer here to the how-to-walk-across-various-Portland-bridges-without-dying genre, of which cyclotram is the primary and perhaps only contributor.) My small efforts (like this) perhaps don’t count, since I am in fact running, not walking, which arguably makes it easier not to die. Cyclotram’s posts also have a lot more pictures, maps, and history than mine. He makes the interesting note that the Ross Island Bridge has been crappy to walk across since the 1940s, which demonstrates some remarkable forward-thinking. I decided to run across the Ross Island Bridge today because (a) I never had and (b) I thought it would be a good way to get an eight-mile run from our new place in NW Portland. This eight-miler capped an 18-mile week for me, and my toe feels entirely healed. I’m slow slow slow still but I’m getting back. Three very slow miles yesterday, with the running group. It was fine. I could feel a little pressure and numbness in my toe, but nothing alarming, and it felt perfectly fine post-run. As much as I’d like to ramp up my miles immediately, I’ll probably try to stick to alternate days running and resting it until it regains its full flexibility: right now, it’s still little difficult to bend it fully down, presumably indicating that there’s still some swelling. I ran a mile today. You are currently browsing the I'd Rather be Running blog archives for February, 2012.